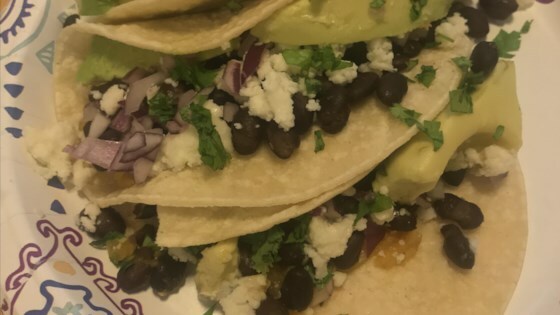 "My daughter-in-law made these as a delicious, low-fat alternative to beef tacos! This is her recipe, and they are delicious!!" Make 1-inch deep punctures all over squash with a serrated knife. Microwave squash on high for 6 to 8 minutes; turn over and microwave until squash is steaming and cooked through, another 8 to 10 minutes. Let cool for 5 minutes, cut in half lengthwise, take out seeds, and shred the flesh with a fork. Mix fresh lime juice, chili powder, ground coriander, ground cumin, and coarse salt in a large bowl. Add shredded spaghetti squash; mix well. Place black beans (heat if desired), crumbled queso fresco, chopped red onion, and chopped cilantro into separate bowls. Heat corn tortillas in a skillet over medium-low heat until warmed and flexible, about 30 seconds per side. Spread each tortilla with a spoonful of black beans and squash mixture, and a sprinkling of queso fresco cheese, onion, and cilantro; top each serving with salsa. Spaghetti squash stands in deliciously for regular old pasta. Red onions can be cooked in a skillet with a little vegetable oil if preferred over raw. Used the taco seasoning 1 recipe, recipient this was delish! Thank you for sharing. GREAT recipe. Giving one star because it is EXACTLY the same recipe published in 2012 by Deb Perelman in her Smitten Kitchen cookbook. Not cool! I followed the recipe exactly and enjoyed every bite. This is a great way to serve spaghetti squash when you want something different. Thanks for sharing! The recipe calls for 16 tortillas, but makes 6 servings. Shouldn't it be 12 or 18 tortillas so the number of tortillas per serving comes out even? So easy and really delicious! I was delightfully surprised. Great flavour and very filling. On filled wrap was enough but it was so good I had two. Will definitely make again.